The Pittsburgh Pirates have made some big changes to their bullpen over the last few weeks. They traded Chris Resop, signed Jason Grilli, traded Joel Hanrahan, and acquired Mark Melancon in that same trade. Now that the Hanrahan trade is done, let’s take a look at the makeup of the new bullpen. Jason Grilli is the new closer. Jason Grilli, RHP – Grilli will make $2.25 M in 2013, along with a $500,000 signing bonus. He’s the new closer with Hanrahan gone. Mark Melancon, RHP – Since he was one of the main pieces in the Hanrahan trade, he’ll be guaranteed a roster spot. Melancon is a great bounce back candidate, and could settle in as the 8th inning guy. 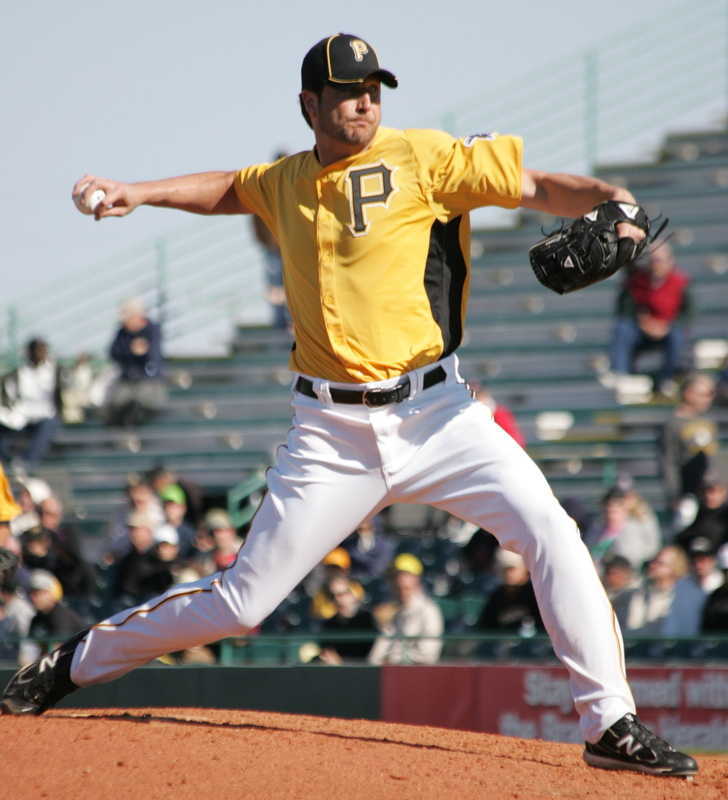 Chris Leroux, RHP – Leroux hasn’t had much time in the majors yet, but he has been impressive in his time with the Pirates. He adjusted his delivery in 2011, which allowed him to jump from Double-A to the majors in one year. Last year he dealt with arm issues, then arrived in the majors at the end of the season. In his combined time with the Pirates he has posted some dominant numbers, with an 8.8 K/9, a 2.6 BB/9, and an 0.2 HR/9 in 41 innings. He might not be guaranteed a spot, but those ratios make him as good of an option as any on this list. Bryan Morris, RHP – Morris is the top relief pitching prospect in the system, and is out of options this year. He had a lot of success last year after adding a cutter. The pitch started as a slider in 2011, then turned in to more of a cutter when Morris started throwing it harder. That gave him a dominant strikeout pitch to pair with his mid-90s fastball. He’s got the stuff to eventually close, but could spend the 2013 season being eased into the majors in a middle relief role. Rick van den Hurk, RHP – I could see the Pirates going either way with van den Hurk. I could see them waiving him at some point this off-season, since he doesn’t really have a strong track record of success. On the other hand, he pitched great in Triple-A last year, with an 8.2 K/9 and a 2.6 BB/9 ratio. He also throws a fastball that has averaged in the 93-94 MPH range the last two years. He’ll probably compete for one of the final spots in the bullpen if he remains on the roster. Vin Mazzaro, RHP – The Pirates added Mazzaro in a trade earlier in the off-season. They didn’t send out much, trading two players who were in the DSL last year. One of those players, Luis Santos, was a hard thrower who was set to make the jump to the US this year. Neither player is meaningful enough to guarantee Mazzaro a spot. He provides the Pirates with some early season rotation depth. He’s also the type of pitcher they tend to prefer — a hard throwing sinkerball pitcher with a good breaking pitch. With the addition of Francisco Liriano, he’s got no chance of making the rotation. He’ll probably battle for one of the final spots in the bullpen. Tony Watson, LHP – Watson is pretty much guaranteed a spot. He’s the top left-handed reliever and aside from that has put up some impressive numbers the last two years, with an 8.6 K/9 and a 4.1 BB/9. He saw some improvements last year. His K/9 went from 8.1 to 8.9. His BB/9 dropped from 4.4 to 3.9. His HR/9 dropped from 1.3 to 0.8. He could use some additional improvements with the control, but right now his stuff is good enough with a K/BB ratio greater than 2.0. Jared Hughes, RHP – Hughes pitched the most innings in the bullpen last year with 75.2. His 2011 and 2012 seasons were two different stories. In 2011 he posted an 8.2 K/9 and a 3.3 BB/9 ratio, although only in 11 innings. In 2012 he posted a 6.0 K/9 and a 2.6 BB/9 ratio. Those strikeout numbers aren’t as dominant as other pitchers in the bullpen. Where Hughes has an advantage is with his extreme ground ball rates. He has a 60.2% ground ball rate in his career, thanks to throwing his sinkerball 86% of the time. His ERA was 2.85 last year, but his xFIP was 3.89. Because he relies on his fielders so much, he’s susceptible to luck influencing his overall results. The Pirates have a strong infield defense, which could help his overall numbers. He should be guaranteed a spot, but I see him more as a middle reliever, rather than a late innings option. Zach Stewart, RHP – Stewart was one of the top prospects in Toronto’s system a few years ago. He has been hit hard in his limited time in the majors, with a 2.18 HR/9 ratio over 103 innings. That home run ratio is due to a 22.5% HR/FB rate. He’s also had a .350 BABIP. Both are far from the league averages of around 10% and .300, respectively. That could mean one of two things. Either Stewart is extremely unlucky, or he’s got an issue with his command or delivery that is allowing him to get hit hard. My guess is that it’s the latter. That means he’d be better off spending time in Triple-A to start the year, trying to make the necessary adjustments. Andrew Oliver, LHP – Oliver was one of the top 100 prospects in the game heading into the 2011 season, per Baseball America. The Pirates traded Ramon Cabrera to acquire him during the winter meetings. He’s got a fastball that can get up to the mid-90s, and the potential for a good breaking pitch. The Pirates could take two approaches with him. They could try to put him in the bullpen and let him try to make it as a second lefty reliever behind Watson. The alternative is sending him to Triple-A and working on his mechanics. He was rushed in Detroit’s system, and dealt with some serious control issues in Triple-A and the majors. If he can cut down on the walks, he could get back to his former upside as a middle of the rotation starter. He’s got one option left, and that time would be best spent trying to fix his control in the minors, giving him the chance to have more value than a lefty reliever. Justin Wilson, LHP – The Pirates have told Wilson to prepare as a starter, although that could be because it’s easier to go from starting to the bullpen. The lefty has some of the best stuff in the system, with a mid-90s fastball, two good breaking balls, and a good changeup. He has a lot of movement on all of his pitches. Unfortunately he struggles with control issues, which hurts his value. Wilson moved to more of an over-head delivery last year, aimed at keeping his body from moving around to make it easier to repeat his delivery. That worked initially, but the control issues resurfaced later in the year. Wilson has control problems no matter what his role. Even with the walks he could be a late inning reliever or a strong fourth starter. He’s got two options left, so there’s still time to work on his issues in Triple-A. However, he would be my leading candidate to make it as the second left-hander in the bullpen. At this point there seems to be little hope of his control improving, and Kyle McPherson or Jeff Locke look like they could be better options in the rotation to start the year. Duke Welker, RHP – Welker has similar stuff to the recently departed Hanrahan. He throws a fastball that sits in the upper 90s, touching triple digits last year. He also throws a hard slider that sits in the upper 80s. Like Hanrahan, Welker has dealt with control issues at times in his career. His control was horrible in 2010, with almost a walk per inning. He improved on that in 2011 and 2012, although his walk rate went up in Triple-A. He’s got the stuff to be a late inning reliever, but he also has two options remaining so he will probably go back to Triple-A and keep working on his control. Vic Black, RHP – Black posted some dominant numbers as Altoona’s closer last year, but had some control issues. Those control issues got worse in the Arizona Fall League. The right-hander throws an upper 90s fastball and a plus slider in the mid-80s. He was working on adding a two-seam fastball in the AFL, which is meant to be a weapon when he’s behind in the count. He’s got the stuff to be a closer in the majors, but the control issues are a problem. Black was just added to the 40-man roster and has three options remaining. He should use one of those options for the 2013 season trying to fix his control problems in Triple-A. Hunter Strickland, RHP – Strickland was somewhat of a surprise addition to the 40-man roster this off-season. He’s got a fastball that can sit in the mid-90s, and pairs it with a good changeup and an improving curveball. He didn’t have the best results in Altoona last year, with a 7.0 K/9 and a 3.2 BB/9 ratio. Strickland has a good frame and impressive stuff. He probably won’t make the bullpen in 2013, since he’ll spend most of his time in Double-A and/or Triple-A trying to improve his curveball into an out pitch. Brooks Brown, RHP – Brown is a sinkerball pitcher with a big breaking slider that can be a plus pitch. He’s been a starter most of his career, but the lack of a good changeup could make him better as a reliever. He should begin the year in Triple-A. Erik Cordier, RHP – Cordier can throw as hard as 97 MPH with a slider that can be a plus pitch at times. He’s dealt with some horrible control in the top levels, and should start out in Triple-A. Ryan Reid, RHP – Reid has posted some impressive numbers in the past with Tampa Bay, with a 9.0 K/9 and a 3.2 BB/9 ratio in 79.1 innings last year in Triple-A. He’s a small reliever, which raises questions of whether he can have the same success in the majors. He’s another depth guy in Triple-A. Kris Johnson, LHP – Johnson spent a lot of time in the upper levels of the Pirates system last year. He split time between the bullpen and rotation, posting better numbers in the bullpen. He’ll probably return to the same role in 2013, and will serve as left-handed depth if the Pirates have some injuries in the majors. Mike Zagurski, LHP – Zagurski throws a fastball in the low-90s, along with a plus slider. He’s dealt with control issues, with a 5.0 BB/9 ratio in 69 innings in his major league career. He does get a lot of strikeouts, with a 9.1 K/9 ratio in that time. He’s another depth option who should start in Triple-A. Chad Beck, RHP – He’s not a non-roster invitee, but Beck is included here because he was on the 40-man roster until being DFAd yesterday. Beck was claimed earlier in the off-season from Toronto. That means every American League team passed on him, and a few of the National League teams passed on him. That gives him a good chance to clear waivers. He’s got a fastball that sits in the 94-97 MPH range, but has dealt with some control issues (noticing a trend with the NRI guys?). That fastball makes him an interesting depth option. The guys listed above are the guys who I think have spots guaranteed. I think Chris Leroux would have a strong chance at one of the final two spots as the bullpen is made up right now. The smart move with the final two spots would be to go with two of Leroux, Mazzaro, or van den Hurk. The Pirates should send Stewart, Oliver, and Wilson to Triple-A to work on their issues in the rotation. They have more potential value than the 5th/6th bullpen options. Welker, Black, and Strickland all have the stuff to be late inning relievers, but all need more experience in the minors. Welker would be the closest of that group. I don’t see any of the NRI guys making it, unless they have a really impressive performance during Spring Training, while showing impressive stuff. I wouldn’t rule out the Pirates adding a reliever in January, simply because it’s what they do every year. Last year they added Juan Cruz for $1.25 M. Prior to the 2011 season they signed Jose Veras for $1 M. In 2010 it was Brendan Donnelly, D.J. Carrasco, and Octavio Dotel, in a year where they had more bullpen spots open. I wouldn’t begin to guess who they might sign. Every year it seems there’s a few relievers who unexpectedly are still on the market in late-January. I wouldn’t be surprised if the Pirates once again sign one of those guys. Two observations, first once again at this point anyway we only have one lefty in the pen. It is my opinion that a second lefty is a necessity especially with Hurdle’s unorthodox approach dealing with left on left right on right matchups. One of Oliver or Wilson has the inside track on the 2nd lefty position. Considering the makeup of the bullpen the last few years, it wouldn’t be out of the ordinary for one or two of those guys to make the opening day roster. Last year they had Jared Hughes and Evan Meek. Hughes had 11 innings in the majors and Meek had struggled. The year before that it was Mike Crotta and Garrett Olson. The Pirates have shown a tendency to give chances to non-established relievers. Some of those guys work out. The ones that don’t usually get a quick hook. We’re talking about the final two bullpen spots here. Not exactly a lot of potential value to be had. That’s where you take chances on guys like Leroux, hoping those strong ratios translate to success. Leaving two spots open for Leroux, Mazzaro, and van den Hurk is nuts. All three are reclamation projects, horribly unreliable at best and Vandenhurk and Mazzaro espcially haven’t the slightest track record of even mediocrity. Anyone general manager who takes 2 of the three north should be relieved of his duties. I am even reticent to take Leroux north, sooner or later we have to be a serious team which treats ever roster spot as something of value. There is a good chance Leroux implodes and costs the team 2 or 3 games. Vandenhurk bizarrely cost the team a very important game in a pennant race. If you want to analyze Huntington’s roster building, don’t ignore the replacement parts he called up for the bullpen in September, everyone subtracted from team in that mess. I don’t think Neal Huntington would start the season with the bums you suggested at the back end given his track record over the past two years and i think your suggestion of it is off the mark. Why not simply point out that the proposed bullpen, without an addition or two, isn’t going to cut it?. As someone who knows his delivery has been changed 2-3 different times while a pirate along with his arm action hitting the middle of the back stop isn’t a surprise Tim. Once in a while actually do some real research into the why. Black had a BB/9 rate of 5.9, 5.9, and 4.1 in college. In his entire pro career he’s never been below a 4.3 at any level. So if you’re suggesting that the control issues are because of changes the Pirates made, then you’re wrong. These issues have been around his whole career. As for the changes in his delivery, they were made to prevent injuries. Black was very injury prone at the start of his career. So far the changes have worked, as he’s been healthy since his last injury in early 2011. He’s also regained his velocity, and added to his pre-draft velocity. No one is saying that Black is a bad pitcher. But he does have control issues. That’s undeniable. Neil seems to be cornering the market of pitchers with control problems. Relievers first have to be able to throw strikes. Most of the time relievers come in with men on base and they can’t afford to start walking people. I enjoy the website. What are the chances Kris Johnson can make team. It looks like he has had a great DWL. Victor Black has control issues? His ERA was what last season? His walk to strikeout ratio was what? He was totally gassed in the Arizona Fall league working on a new pitch. What does his ERA have anything to do with his control issues? He had a 4.4 BB/9 ratio last year. He walked more than he struck out in the AFL. Maybe you can chalk that up to being tired or working on the new pitch, but he has a career 4.7 BB/9 ratio. As someone who has seen him hit the middle of the backstop with a pitch, I can tell you he has control issues. We traded an all star closer for what is described here for a “bounce back candidate”? This just gets better… And next is Jones… Count in #21 and last place coming up. Just like when Hanrahan was acquired and was a strong “bounce back candidate”. Go find a different site to complain on. When the Pirates picked up Hanrahan he was just another guy who threw hard but hadn’t had any big-league success; the Pirates have plenty of guys who fit that profile (and Melancon has had one successful season closing)–if the Pirates have proved one thing, it’s that you can always find someone who can close effectively on the cheap. Incidentally, do you really think the Pirates will finish behind the Cubs? Has there been any comments from Grilli about his new role? The departure of Hanrahan, who ranks fourth in Pirates history with 86 saves, makes Jason Grilli the closer going into the 2013 season. “It‘s Jason‘s job to keep,” general manager Neal Huntington said. Grilli, 36, has just five saves over 10 seasons in the major leagues. This will be the first time he goes into a season as the closer. Since I just received the P2 Prospect book, I KNOW who all the top stars are gonna be. Great job as always Tim! But where’s the Index page???? All of the players are in alphabetical order, so I figured the index page was kind of redundant. Wouldn’t mind seeing Mike Gonzalez come back on a reasonable contract. High strike out rate, good ERA and veteran presence. If he has a good year we may be able to trade him at the deadline to a contender. I’m a Gonzo fan, too. In fact, Wilson reminds me of him. Walk 2, K 3, inning over. With McPherson and Locke fighting for the 5th rotation spot, wouldn’t the loser of that battle also go to the bullpen? Kind of in a long relief/6th starter/Jeff Karstens type role. No. They would probably go to Triple-A. What exactly do Locke or KMac have to learn at AAA? At age 25 they should be in the majors. Take a page from the Earl Weaver handbook and follow what St. Louis does. There is nothing wrong with SP prospects learning to attack MLB hitters out of the pen. That’s a much better use of innings than van den Hurk or Mazzaro. If there is an injury I think the last thing you would want to do is have to stretch one of those guys back out again. Keep them in starter shape because inevitably you will need 8 or 9 starters… not a question if but when. McPherson might need some more time in Triple-A. The main focus would be keeping them both fresh and stretched out in the event of an injury. The main focus should be on developing them as MLB pitchers, not hedging against injury. I disagree. Whoever loses the battle should be moved to Triple-A and should be the sixth guy in the rotation. It’s not like he’ll be down that long. Both will probably be in the majors by the end of May if the Pirates have a normal team’s amount of injuries/poor performance. No because that is what Leroux would be doing…..